As rates have risen, investors have, once again, started asking the perennial question: Is the bond bull market over and are rates normalizing? In thinking about bond yields, it is important to keep longer-term factors in mind that have nothing to do with central bank policy. Low yields have correlated with two, related longer-term trends: low nominal GDP (NGDP) and an aging population. The reason they’re related is that an aging population means slower growth in the workforce, and in turn, slower economic growth. An aging population impacts rates through a second mechanism. As consumers age, their borrowing and investing patterns shift. Older households tend to borrow less and demonstrate a preference for income, in the process raising the demand and lowering the supply of bonds. The net result is that older populations tend to be associated with lower real, or inflation-adjused interest rates. This dynamic has been at work for decades and helps explain why low yields predated the financial crisis. Because the population will not get younger any time soon, what would need to change to push rates back to “normal”? In terms of the real economy, the simple answer is faster nominal growth. Looking back over the past 60 years, the level of nominal growth has been the key to understanding the level of rates. During this period, a smoothed average of nominal growth explains almost 60% of the variation in long-term rates (see the chart below). “Property is as safe as houses, at least until the roof falls in. Our latest tally of global housing markets shows that American house prices have recovered to a new nominal high, and in Spain and Ireland, prices are again rising at a decent clip. 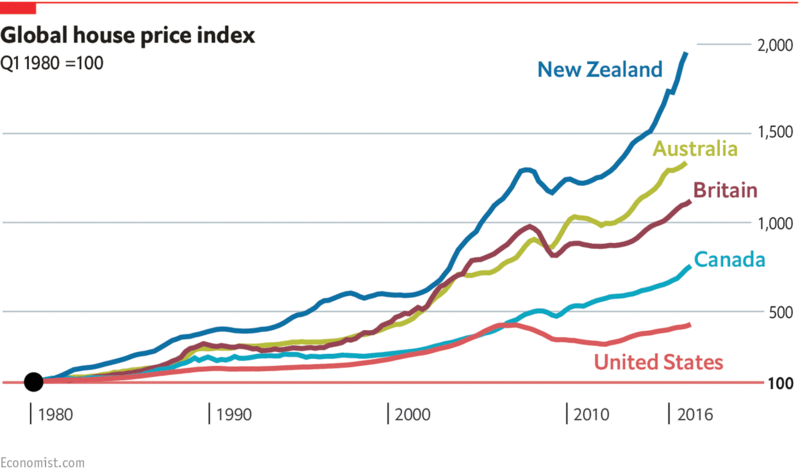 In the English-speaking Commonwealth countries of Britain, Canada, Australia and New Zealand, prices have risen largely unabated in recent years. Since autumn 2014 $1.3trn of capital has flowed out of China. Some of that cash has found its way into residential property in some of the world’s most desirable cities. In America, Chinese investors bought some 29,000 homes in the 12 months to March 2016 with a total value of $27bn, according to the National Association of Realtors. Much of this money is focused on a handful of cities: Seattle, San Francisco, New York and Miami. Foreign money has helped propel skyrocketing prices in other places, too. In Vancouver, home values have risen by 47% in four years; in London they have risen by 54%; and in Auckland the rise has been a whopping 75%. The influence of foreign capital flows on housing markets is being scrutinised, particularly as affordability becomes ever more stretched. What Caused the Decline in Long-term Yields? “Long-term U.S. government bond yields have trended down for more than two decades, but identifying the source of this decline is difficult. A new methodology suggests that reductions in long-run expectations of inflation and inflation-adjusted interest rates have played a significant role in the secular decline in yields. In contrast, standard statistical finance methods appear to overemphasize the effects of lower risk premiums and reduced uncertainty about future inflation. Identifying the sources of this long-run decline in interest rates is of great interest to monetary policymakers, bond investors, and other financial market participants. But it is quite difficult to do. Standard statistical finance methods as employed, for example, in Wright (2011), suggest that the reduction largely reflected a decline in inflation uncertainty and that any decline in long-run expectations about inflation rates or real, that is, inflation-adjusted, interest rates played a small role. However, these methods suffer from statistical bias and can give misleading results. In recent research, we correct for this bias and reexamine the variation in long-term interest rates (Bauer, Rudebusch, and Wu 2013). ThisEconomic Letter summarizes our results, which differ from the standard ones by suggesting that falling long-run expectations of inflation and real yields were an important part of the secular decline in long-term yields. A clip from a video talk: the Commodities market. What is the commodities market?